Partner Research Manager in the Deep Learning Group at Microsoft Research AI. IEEE Fellow. From 2014 to 2017, I was Partner Research Manager in Business AI at Microsoft AI & Research and at Deep Learning Technology Center (DLTC) at Microsoft Research, Redmond. I lead the development of AI solutions to Predictive Sales and Marketing. I also work on deep learning for text and image processing (see our ACL/SIGIR2018 Tutorial, DeepLearning2017 Tutorial and IJCAI2016 Tutorial or MS internal site) and lead the development of AI systems for dialogue, machine reading comprehension (MRC), and question answering (QA). DSSM [project site]: We have developed a series of deep semantic similarity models (DSSM, also a.k.a. Sent2Vec), which have been used for many text and image processing tasks, including web search [Huang et al. 2013, Shen et al. 2014], recommendation [Gao et al. 2014a], machine translation [Gao et al. 2014b], and QA [Yih et al. 2015]. MRC [project site]: We released a new MRC dataset, called MS MARCO; and have developed a series of reasoning networks for MRC, aka ReasoNet, ReasoNet with shared memory, and SAN. From 2006 to 2014, I was Principal Researcher at Natural Language Processing Group at Microsoft Research, Redmond. I worked on Web search, query understanding and reformulation, ads prediction, and statistical machine translation. From 2005 to 2006, I was a research lead in Natural Interactive Services Division at Microsoft. I worked on Project X, an effort of developing natural user interface for Windows. 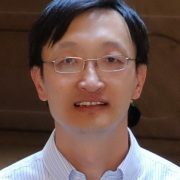 From 1999 to 2005, I was Research Lead in Natural Language Computing Group at Microsoft Research Asia. I, together with my colleagues, developed the first Chinese speech recognition system released with Microsoft Office, the Chinese/Japanese Input Method Editors (IME) which were the leading products in the market, and the natural language platform for Windows Vista. Currently, I live with my family in Woodinville, WA. Orthant-Wise Limited-memory Quasi-Newton Optimizer for L1-regularized Objectives [download].